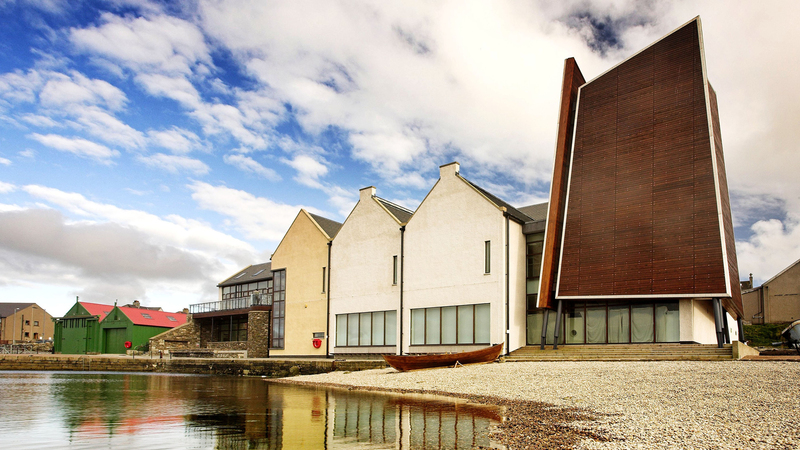 This landmark project, on the seafront in Lerwick, created a new museum and archive store in which the multitude of valuable and historic exhibits and materials dispersed across the Shetland Islands could be properly displayed, protected and accessed by the public. The chosen site for the building sits in a prominent position within Lerwick, on the historic Hay’s Dock. The dock itself is a Grade B listed structure, and its repair and restoration formed an integral part of the project, along with the refurbishment and incorporation of several working boatsheds. The new museum building was architecturally designed by BDP, taking inspiration from the sea fronting gables of Lerwick. It features a three-storey high boat hall, which displays hanging boats, a ‘state of the art’ archive repository, three times the present archive study area and a flexible 120 seat lecture theatre, as well as the main museum display area itself. The boat hall structural design used 4 steel framed panels, linked at the head with a rigid ring beam, akin to leaning 4 playing cards together but then rigidly connected them. The secondary structure was entirely timber framed and timber lined. Woolgar Hunter were presented with a ‘Wood Award’ in 2008 for the structural use of timber on this building. The archive store was elevated onto the first floor of the building to avoid future flood risk due to climate change. This imposes particularly high loads on the floor structure from the rolling racking, which also demands very tight deflection tolerances. Shetland Amenity Trust were committed to sustainable design and as such, this project utilised many locally recycled and salvaged materials, including timber floors and bulk timber lintols.